For years, my school, Washington Elementary in Big Spring, Texas, struggled to meet all our students’ literacy needs. We group students in tiers, as in the “Response to Intervention” model, but each year we were still left with extremely large groups in Tier II and Tier III — struggling students and chronically struggling students. Each year, we tried to reinvent the wheel to increase our student success, but to no avail — until last year. Most of Washington’s students come from low socioeconomic status households. Several have grandparents or someone other than parents raising them, several come to school hungry and dirty, many have parents who work multiple jobs and cannot help with homework, and quite a few have at least one parent in prison. When small children are forced to deal with situations like these, school often takes a back seat. Nevertheless, my coworkers and I must make sure they receive a quality education. That’s when I saw the value of my new role as a multi-classroom leader. As an MCL, I no longer had my own classroom all day; instead, with the time to co-plan, collaborate, co-teach, and track and analyze students’ data, I could lead my teaching team in using strategic student placement and monitoring to finally find success. Last year I worked primarily with first grade. My goal was to help kids read on grade level. That was crucial to get right in first grade because year after year we found that several of our students had reading fluency issues; these interfered with their ability to comprehend what they read and eventually stymied them when they hit third grade, the first time they faced state tests. But just reading on level was going to be a difficult task. As I analyzed the data, I realized that we had 31 students reading on an appropriate level for first grade, 15 students who were almost where they needed to be (Tier II), and then a whopping 39 students well below the recommended reading level for first grade. Something needed to change! For Maina Cisneros, confronting her students’ reading needs called for a new way to think about how to use teachers’ time, based on a deep review of student data. 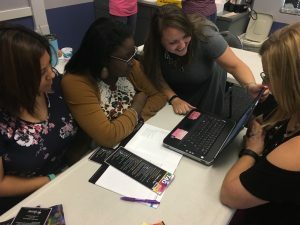 Breaking free from the one-teacher-one-classroom standard proved crucial–as was the role of a multi-classroom leader, empowered with time to figure out an innovative solution and leadership to make it happen. Read her story, and her team’s results, in our ongoing Opportunity Culture series in The74million.org.